Last week, along with other members of the press, we were invited to Pixar to watch the studio's latest short, Lava, and the first hour of the new feature Inside Out. We were delighted with what we saw: an incredibly ambitious film that maintain's Pixar's emotional core while introducing us to some fascinating ideas. Here are our spoiler-free first impressions. The premise behind Inside Out is deceptively simple: Riley (Kaitlyn Dias) is a young girl who has a group of anthropomorphic emotions rattling around in her mind: Joy (Amy Poehler), Sadness (Phyllis Smith), Anger (Lewis Black), Disgust (Mindy Kaling), and Fear (Bill Hader). These five react to different experiences in Riley's life and inspire feelings of, well, joy, sadness, anger, disgust, and fear in the girl. They don't drive her like a robot, but each emotion loves Riley and wants to protect her. Riley has had a very happy childhood, much to the delight of the (somewhat pushy) Joy, but that changes when Riley moves from her idyllic Minnesota hometown to San Francisco. The emotions are thrown into turmoil, and after the mechanisms of Riley's mind start behaving oddly, Joy and Sadness find themselves far from home, in the deep reaches of the girl's consciousness. Inside Out has invited inevitable comparisons to other stories that anthropomorphize human psychology, like Herman's Head. But there's a bit more happening with Inside Out. The filmmakers, including director Pete Docter and producer Jonas Rivera, were quick to emphasize that this film is set inside the human mind, not inside the human brain — and Riley has a vast mindscape to explore. One thing that is incredibly impressive about the first hour of the film is how clearly it expresses the workings of Riley's mind. It would be easy for the film to get bogged down in the details, but the visual design and careful storytelling quickly reveal the rules of the world and set up the movie's surprisingly high stakes. We understand the significance of Riley's memories (those multicolored orbs we keep seeing in the trailers), and how the different emotions can use the memories to inspire thoughts and ideas in Riley's head. But the real, ahem, joy of the movie is seeing all the ideas that the filmmakers have come up with to explain how the mind works. Throughout the filmmaking process, they continually asked themselves, "Why does my mind do that?" They came up with some pretty hilarious answers to questions like, "Why do I remember some things but not others?" "Why does that obnoxious thing keep popping up at the front of my mind?" "Where the heck did that dream come from?" Even though the answers to those questions involve little people running around your head with industrial equipment, some of them make a weird kind of sense. Also, add this to the list of films where some of the jokes are going to fly right over little kids' heads and into the happy spot in older viewer's brains. The jokes aren't just funny — there's an impressive range of humor on display. Sometimes it's hilariously macabre slapstick. Sometimes it's about laughing at uncomfortable truths. There is one sequence — one that is sure to be the film's most-talked about scene — that touches on art history and... well... something I won't even begin to spoil. Let's just say the kids may need a geometry lesson to get all the jokes. Even though we only got to see the first hour of the movie, I can already tell that Inside Out is a film that will reward rewatching. I'm already itching to go back and see what I missed the first time around. Hopefully the overarching story will prove just as exciting in the end. To some extent, Inside Out is actually two films: one about Riley and one about her emotions. Riley's story is, naturally, the more mundane of the two, but it always feels necessary. Everything about the two worlds — the one inside Riley and the one outside Riley — feels distinct: The colors inside are brilliant while the colors outside are muted. Inside is shiny while outside is matte. Where inside is cartoony and smooth, outside is filled with textures and grime. Even the focus is different; the layout team simulated different camera lens for the different worlds. Inside is always sharply in focus, but outside, the camera sometimes deliberately goes out of focus. There's no question which is the real world. It would be easy to wave off Riley's story as unimportant. Her emotions are going on this grand quest while she's just adjusting to a new town and a new school. But the fact that the stakes are so high inside Riley's mind makes her story compelling, because we're forced to worry about her and her emotional future. Riley's story also adds something that the film desperately needs: a sense of psychological realism. 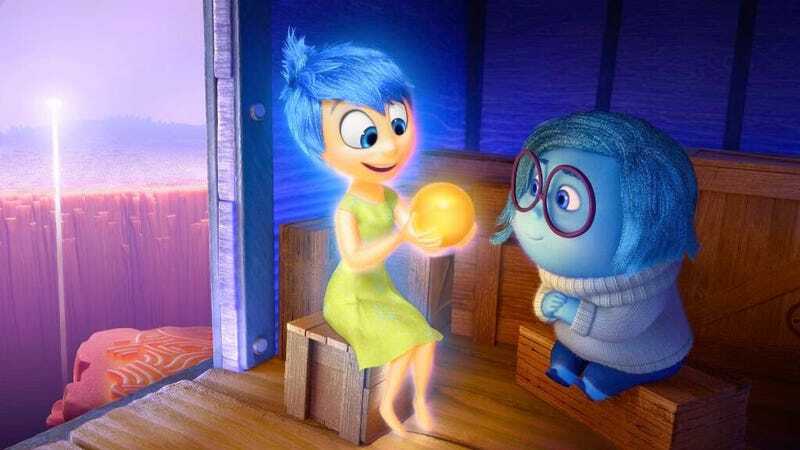 It's fun to travel through the countryside of Riley's psyche, but Inside Out has something very important to say about feeling our feelings, and how our emotional states change as we grow up. For that, we need Riley's story, and while it's a simple one, Inside Out makes it stunningly insightful. On a less serious note, if you've ever lived in San Francisco, Inside Out has a few jokes that are just for you. Don't worry, we haven't forgotten about Lava, the short film that will be playing with Inside Out. We'll talk more about Lava later on, but let's just say it's a charmer. We may be biased, though. Director James Ford Murphy explained that Lava was inspired, in part, by the Lōʻihi Seamount, an underwater volcano that is expected to form an island in 10,000 to 50,000 years and eventually merge with the Big Island. We're suckers for geological romance.